No matter where you live or what you call it, the object of the last day before Lent is the same: eat as much of the soon-to-be-forbidden foods as you can before it’s too late. Lent, which begins this year on Wednesday, February 17th, is a 40 day season during which Christians traditionally fast, pray, and give alms to the poor. In the Medieval period, observant Christians were forbidden meat, milk, eggs and animal fats during Lent. The modern Catholic church has eased these rules, encouraging voluntary fasting and abstinence. This is defined as eating only one full meal per day (or two small ones which add up to less than one full meal), and the omission of meat and poultry on Ash Wednesday (the first day of Lent), and all the Fridays in Lent. It has also become traditional for people to give up something they particularly enjoy for the 40 day period, although that is not an official church policy. As you might imagine, the Medieval rules led to lots of serious eating during the days leading up to Lent. Aside from having one last taste of your favorites, you needed to use up all the eggs, milk, and animal fats in the house. In the days before refrigeration, using up the meat was not as much of an issue because it was only acquired right before it was to be eaten, so most households didn’t have a lot lying around. In particular the very last day before Lent is a great excuse for wild parties; in Iceland they call it Sprengidagur which means Bursting Day; the French name for it is Mardi Gras or Fat Tuesday; in Sweden it is Fettisdagen; in Estonia, Vastlapäev; in Spain, Martes de Carnaval; in the Czech Republic, Masopust, which means “goodbye to meat,” and in German, Faschingsdienstag. In English-speaking countries it is known as Shrove Tuesday, Pancake Tuesday, or simply Pancake Day. The word “shrove” comes from the archaic verb “to shrive” which means to obtain absolution for your sins. It was important to be shriven before the beginning of Lent as it is a season of penance. Even though the rules are no longer as stringent, this religious tradition has left us with some wonderful seasonal foods. Since their purpose was to use up all of the non-lenten ingredients in the house, they have some things in common. They are often fried and they are very rich, containing eggs, milk, butter, and if a creative cook can manage it, some meat thrown in for good measure. In Portugal they make Malasada which is a fried dough; the Polish enjoy their Paczki or jelly doughnuts; in Sweden you would be eating Semla, a pastry spiced with cardamom, filled with almond paste and whipped cream, and served in a bowl of hot milk; in Croatia, which was part of Venice for hundreds of years, they eat Fritule which are fritters enhanced with brandy and lemon zest; and the denizens of the Czech Republic say “farewell to meat” by holding large pork feasts during the time leading up to Lent. 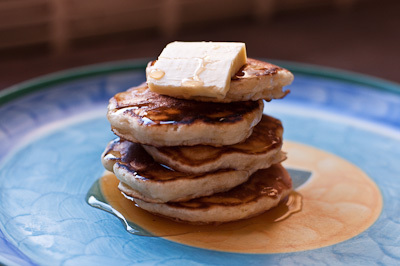 In English-speaking countries the traditional Shrove Tuesday meal is pancakes, they can be made either savory or sweet and are a great way to use up eggs, milk, butter and other fats. Traditionally in Britain they were served with a rich meat stew. In some places slices of sausages or other meat are mixed right into the pancake batter. Try out the recipe below and imagine, if you will, Medieval British cooks flipping their pancakes while keeping one ear cocked to hear the the ringing of the shriving bell or pancake bell which reminded them to use up all their fats and come to church to be shriven. Stir together the dry ingredients with a fork. In a separate bowl, beat the egg yolks and the milk or buttermilk together, then stir in the melted butter. Pour the eggs and milk into the bowl with the dry ingredients and stir only enough to just wet all the dry ingredients, don’t beat too much; you want it to look lumpy. It should be thick but still pour fairly easily off a spoon. If it is too thick add a bit more milk or buttermilk and if it is too thin add more flour. Whip the egg whites until they form stiff peaks and then fold them lightly into the batter, taking care to deflate them as little as possible. If you cook the pancakes on a non-stick surface you won’t need any butter. If you use a regular pan then use just a little butter to keep them from sticking. Heat the pan over medium-high heat until water splutters when a few drops are sprinkled on it. Use a large spoon to transfer the batter to the pan. Don’t drop it from way up high, just let it pour from the tip of the spoon onto the pan, this will help control the pancake shape. Once you have formed the pancake let it cook for 2-3 minutes or until most, but not all, of the bubbles which form on the uncooked side have burst. Then flip the pancake and cook the other side for 1-2 minutes or until nicely browned. Break open your first pancake to see if the inside is cooked properly and adjust the heat under your pan accordingly, then continue making pancakes until all the batter is used up. To keep the pancakes warm before serving, keep them on a plate in a warm oven separated by clean kitchen towels. Without the towels between them they will steam each other and lose their nice texture. You can prepare a stack of folded kitchen towels in advance and put on pancake in each layer.